Iberostar Playa de Muro Village is located on the golden shores of the Mediterranean in Playa de Muro. 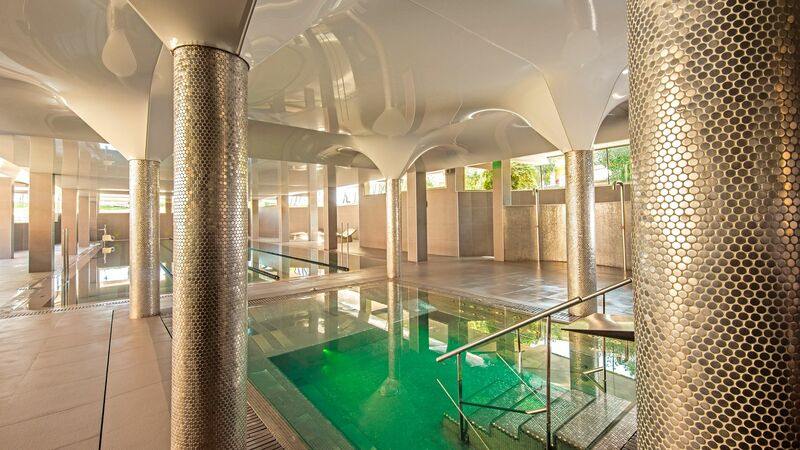 It’s full of fantastic facilities for couples and families, including an extensive spa with excellent treatments and three Kids’ Clubs. There are also three children’s swimming pools and magic shows are held on selected evenings, perfect for your little ones. Spend lazy days by one of the two pools or on the beach, or explore the surrounding area with bicycle rentals from the hotel. The rooms are bright and modern with luxurious amenities right at your fingertips. Guests wanting to keep active can try a range of sports, including tennis and fitness classes for the day. When it comes to cuisine, there are six restaurants, and a range of international menus to choose from. A range of hotel child prices apply to ages 2–6 and 7–14 years. The hotel has 190 rooms, 2 floors over 7 blocks. All inclusive is available between 07:30–00:00 daily. Buffet breakfast, lunch, and dinner. Snacks during the day. Soft drinks, water, beer, local, and international alcoholic and non-alcoholic drinks. Minibar restocked regularly with a selection of drinks. Access to the tennis courts (June–September). 10% off treatments at the Spa. 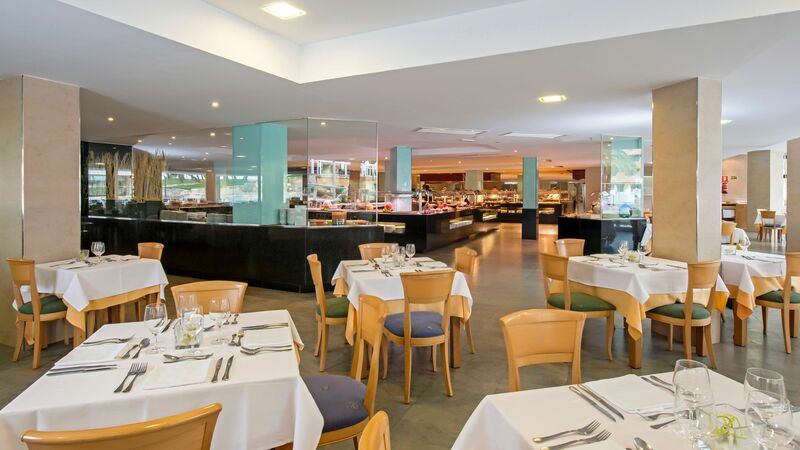 Traditional Majorcan cuisine with international options is served for lunch and dinner in this trendy, modern restaurant. Choose from cold meat platters and freshly grilled fish, as well as lobster rolls, burgers and pasta. 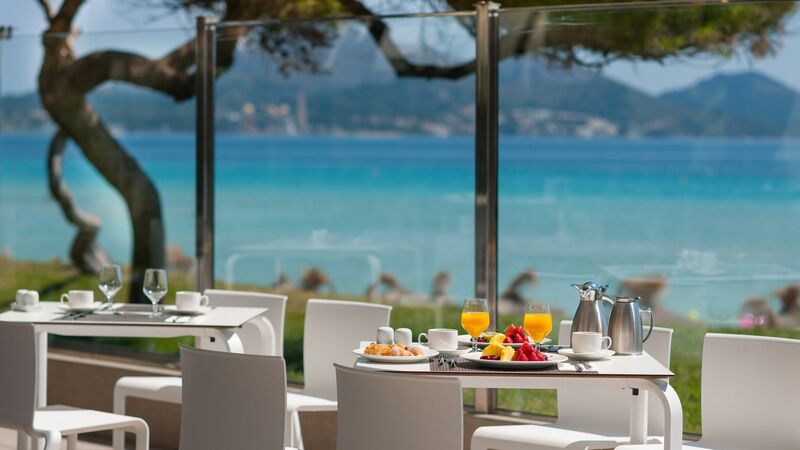 Freshly made pancakes and waffles and buffet style dishes are served as you take in the views of the Mediterranean. Mexican tortillas, Andalusian gazpacho and Asian noodles are just some of the options. This gourmet buffet restaurant serves a range of tantalising delicacies from around the world, including cheeses and cured meats, pizza, pasta, salads and fresh fish. The evening dress code is formal. Gentlemen are required to wear long trousers and a shirt or T-shirt with sleeves for dinner. Enjoy lounger service on the beach as you select from a la carte dishes, including grilled fresh fish, salads, pastas and platters. Take in the views of the Mediterranean as you choose from a buffet lunch menu. International dishes include salads, sandwiches, pizzas and more. 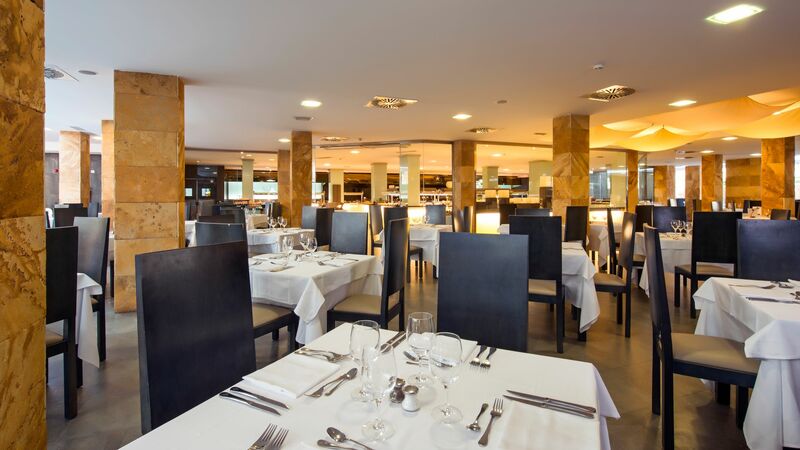 Spanish and international options are served in this buffet style restaurant with an extensive menu. Rice dishes, pasta, salad, meat, seafood and pastas include influences from Asia and South America. There are also show cooking stations where you can watch the chefs at work. Enjoy delicious snacks all day at the Iberostar Playa de Muro Village’s beach bar. Drinks and cocktails are served in this elegant bar where you can choose from unique creations and traditional favourites. Choose from cocktails, wines and spirits as you watch the live entertainment and shows in the evenings. Overlook the swimming pool as you enjoy smoothies, hot dogs, hamburgers and alcoholic drinks from the bar. Choose from 25 beers and relax on the terrace or in the bar. Cocktails and detox smoothies are also available. 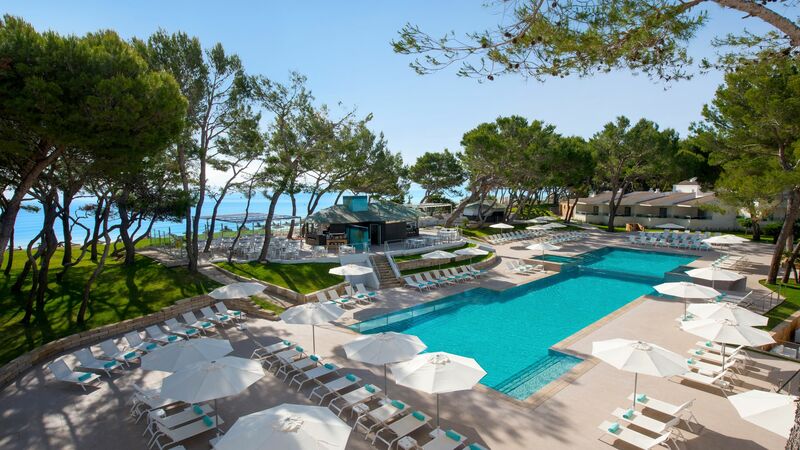 There are two outdoor swimming pools and three children’s pools, surrounded by the hotel’s elegant gardens and offering terraces filled with loungers. Enjoy direct access to the golden sandy beach during your stay, with water sports, loungers and a beach bar available to entertain. 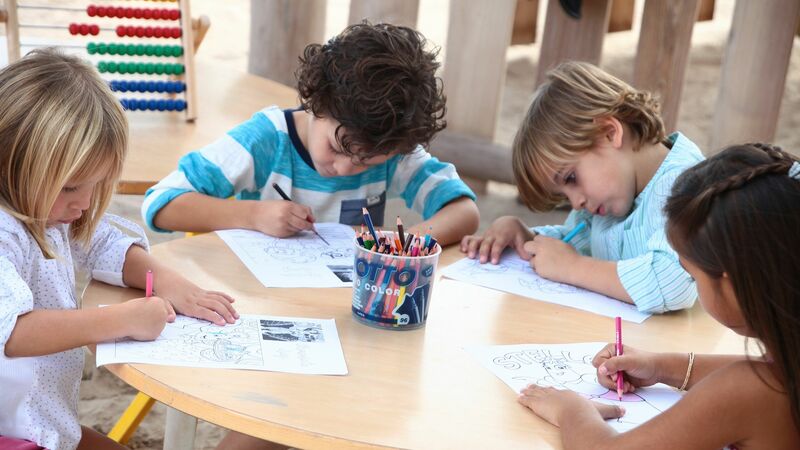 This complimentary Kids’ Club provides fun and games for your little ones all day. Arts and crafts, sports and a mini disco are also offered. Watch your children make friends as they play and have fun in the maxi club. Arts and crafts, shows and sports are included. Teenagers will be kept entertained from morning till night with sports and activities arranged throughout the day. Facial and body treatments are available in the many treatment rooms, while guests can also enjoy the sauna, jet showers and Turkish bath. Take in the beautiful Asian inspired interiors as you immerse yourself in tranquillity. Children accompanied by an adult are allowed to use the indoor swimming pool. 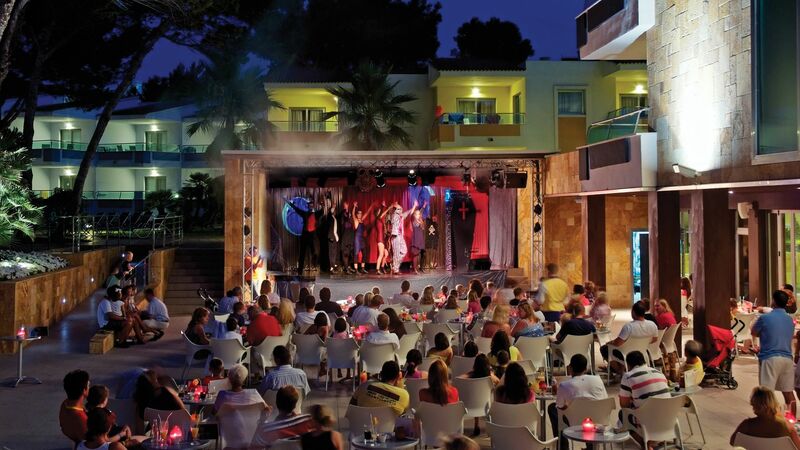 Live music, magic shows, musicals, dancing and more are held in different bars dotted throughout the resort. Sports at the hotel include Zumba classes, tennis, cycling and mini golf. Aerobics classes and water sports are also available. Workshops are led by experts at the Iberostar Playa de Muro Village and include sushi making classes, ice cream workshops and learning to make mojitos and give massages. 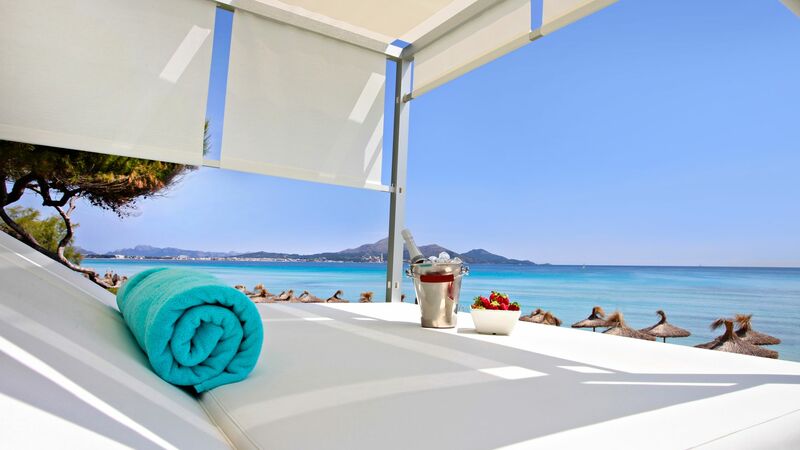 Iberostar Playa de Muro Village is located on Majorca’s north east coast. Overlooking Playa de Muro’s beautiful seafront, it offers easy access to the white sands of the beach, as well as its luscious natural surroundings. Along this stretch of coastline you’ll find plenty of upmarket hotels and restaurants, as well as beach bars and water sports centres. Lively Alcudia is just a 20 minute drive away and is home to a beautiful harbour, pretty waterways, traditional stone buildings and a waterpark. For more historical buildings, cobbled streets and a further selection of restaurants, Pollensa is just over 20 minutes away. Here you’ll find squares full of traditional eateries, little boutiques and a Sunday market. Iberostar Playa de Muro Village is a 50 minute drive from Palma de Mallorca Airport. Double Superior Rooms have been refurbished using neutral colours and feature a bedroom with twin beds, well equipped bathroom and a balcony or terrace with resort views. Family rooms are ideal for families and couples looking for spacious accommodation. Decorated using neutral colours they feature a bedroom with double bed, separate lounge area with two sofa beds, well equipped bathroom, minibar, kettle and microwave and a balcony or terrace with resort views. Suites are spacious and feature large facilities including a separate bedroom, sitting room and furnished terrace with views of the hotel's gardens. Superior Suites enjoy all the great features of the Suites, but with the added bonus of Superior level benefits, including Wi-Fi access, air-conditioning and a turndown service. These upgraded rooms are great for families, boasting a main bedroom with double beds, and a separate living room with two sofa beds. Guests can enjoy pool views from the terrace, along with Superior-level amenities such as air-conditioning, WI-FI access and a turndown service. Please note this image is of a Family Sea View Room, the interior will be very similar to this but with a pool view instead. Save up to 10% discount on the hotel price for holidays 01 - 31 May 2019 booked by 30 April 2019. Save up to 10% discount on the hotel price for holidays 01 June - 30 September 2019 booked by 12 May 2019. Save up to 15% discount on the hotel price for holidays 01 - 12 October 2019 booked by 12 May 2019. Stay 21 nights or more and save up to 10% on the hotel price for holidays between 12 April - 12 October 2019. Wonderful stay here. It had just opened for season and also newly renovated. Staff were really helpful and friendly. Kids club great. Rooms really good. Bathroom no bath. Maybe just a couple of first week niggles like no coffee machine in room then 2 appeared. But absolutely no complaints. A really great holiday. Also area is good. Out of Alcudia and feels quite away from it and actual hotel is much less built up (bungalow style) and less people even when full compared to the other massive hotels. I shall list the positives and negatives in no particular order 1. Great staff, all friendly and helpful. Breakfast staff and live cooking staff are the best. Georgina in particular (guest services) is so is helpful friendly and nice. Restaurant staff all very very attentive. Big thanks to them in particular Mary. Chefs great, they made special veggie food for us. Much appreciated. It was yummy. 2. Food and drinks of a very high quality. Plenty of choice. Only problem is if you get up, say to go to the loo they will take your drink but when you return another will be provided very quickly (big problem you see, fantastic service). 3. Absolutely spotless everywhere. 4. Great daytime and evening entertainment. 5. Geared up for families with young children. Loads of kids around and made to feel very welcome. Our daughter absolutely loved it and loved Georgina in particular. Negatives 1. You know I?? ?m being picky when the only negative I can think of is that the ice cream from the poolside freezer melted. Seriously, that?? ?s it. Enjoy your stay. Thank you for a great holiday. We will be back in the summer. I stayed in a suite with my toddler son, my sister and her husband had a regular room. The rooms were clean, housekeeping was in daily, no complaints there. The main restaurant (for breakfast and dinner) was large and at times noisy, but the food was excellent - I am not sure what other people in reviews complained about. The choices for meals were abundant, both for breakfast and dinner. The beach was the best part, I just can't say enough good things about the ocean and our stay there overall. The personal was helpful and very hospitable. The hotel does deserve 5 stars hands down. WIll try to go again next year. Perfect location and wellrun hotel with great food. Stayed and many others hotels in the area and this one is probably the best managed one. We reserved a family suite with HB and enjoyed it very much. WE also appreciated the friendly and helpful staff and the various restaurant options. We just returned from a 2 week stay at the hotel. It was a very good experience. The hotel is located practically on the beach front. The rooms are situated in relatively small (1 storey high ) buildings surrounded by very well kept gardens. The room was very comfortable (double) with a nice terrace. The only drawback was the very uncomfortable furniture on the terrace. It was difficult to sit outside for more then a couple of minutes. The rooms were very clean, as also was the whole resort. We were on a half-board basis, and we found the food to be very good with plenty of choice ( my only concern was the low quality of eggs - there we 3s- meaning the worst from caged chickens) . The staff were very polite and helpful, especially Joanna at the main restaurant. We also enjoyed the sport facilities.There is a well-equipped gym on the grounds. The instructors were very professional (especially Maria), providing a lot of different classes (joga, pilates, streching, lbt, trx, etc). I highly recommend the hotel and plan to return there in the future.